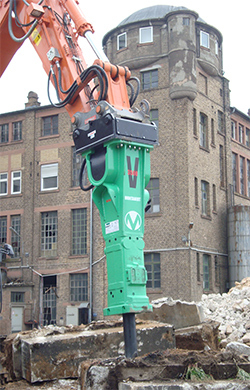 Montabert is the undisputed worldwide leader in the design, production and distribution of hydraulic and pneumatic demolition and drilling equipment for construction and civil works, as well as the mining and quarry industry. The Silver Clip range has a one piece body with no tie rods that might stretch or break, thus avoiding downtime (patented). 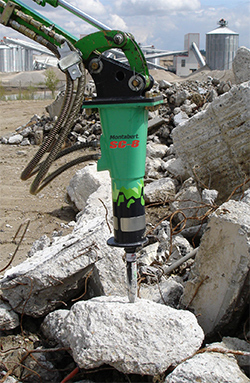 The breaker has blank fire protection as standard to help minimize impact wear. An automatic pressure regulator increases the lifespan of the breaker and to protect the excavator (patented). High power and performance: the energy ratio is higher than all current standards on this range of breakers, enabling optimal efficiency regardless of the material to be broken. An energy recovery device captures and recycles the rebound energy, making it available for the next impact stroke. The Silver Clip is easily adaptable to a wide range of excavators while ensuring optimal performance (even with a high back-pressure). Compact dimensions provide excellent ergonomics and make this breaker ideal for any work. Standard noise isolation on the complete product range ensures reduced noise on job sites. 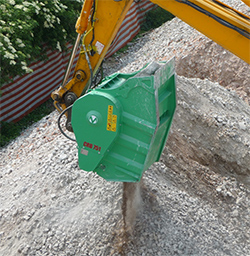 A compacting plate (Clip Ram) and a Clip Bucket are directly adaptable on the hydraulic breaker without having to modify any hydraulic connection or part (patented) (works with SC8 to SC28). Productivity increased thanks to higher energy per blow and higher blow frequency. Greater productivity means faster project completion, cost per cubuc metre reduced, and therefore greater profitability. 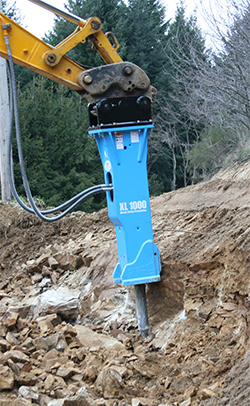 A lighter rock-breaker means greater manoeuvrability for more precise and faster work. This allows to use a more compact and therefore more economical excavator. 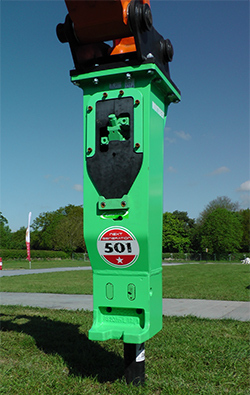 The medium range of breakers with 1 speed (501 NG & 900) covers all excavators between 8 and 25 tonnes in weight, offering reliability and solutions to the customer's needs. The only system of speed variation allowing a perfect adaptation of energy per blow and the frequency of the blow on the hardness of the terrain. High energy or high frequency (patented). Specially recommended to work on homogeneous material. An energy recovery device enables the recycling of rebound energy, transmitting it to the following blow and thus increasing the power of the blow. Because of the high productivity and the optimised hydraulic efficiency of Montabert hydraulic breakers, the energy of the excavator is better converted into shock waves than with breakers using less advanced technology, hence there is a significant saving of fuel. The trouble free breaker with no compromise on quality. With the best steel quality at its core, high manufacturing accuracy with the main components made in Europe. The complete product is assembled and tested in Montabert's high tech European facilities. Keep costs under control whilst delivering the best job to your customers. Blue Line puts quality first with a robust design, without frills, allows a low cost. Only the essential is kept so you pay for rock breaking, nothing else! Montabert's mastery of machining tolerances increases our breaker’s efficiency. The patented main valve controls the piston movement in order to increase the striking power. The energy recovery system increases the striking power using the energy generated by the piston rebound. This system allows an automatic increase of the breaker’s frequency when used on hard materials (without need for manual adjustments). Permits debris to be re-used in situ with one easy collection-crushing operation; or crushes and loads debris for removal. Magnet option: easy to attach to the bucket on-site, this electromagnetic iron separator comes with its own installation kit. Pick up materials and crush them directly on site.